Apple store on 5th avenue, Manhattan, New York City (currently under renovation). 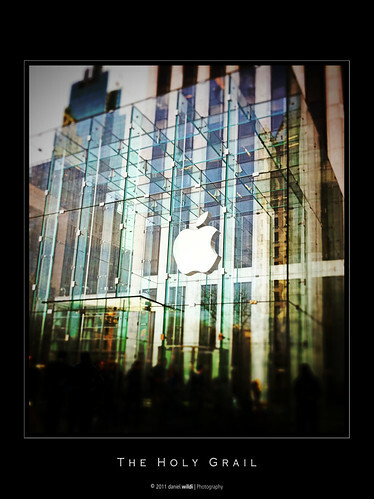 Taken – of course with an Apple iPhone 4 – during our visit in New York, April 2011. Apple Inc. (NASDAQ: AAPL; NYSE: AAPL; previously Apple Computer, Inc.) is an American multinational corporation that designs and markets consumer electronics, computer software, and personal computers. The company’s best-known hardware products include the Macintosh line of computers, the iPod, the iPhone and the iPad. Apple software includes the Mac OS X operating system; the iTunes media browser; the iLife suite of multimedia and creativity software; the iWork suite of productivity software; Aperture, a professional photography package; Final Cut Studio, a suite of professional audio and film-industry software products; Logic Studio, a suite of music production tools; the Safari web browser; and iOS, a mobile operating system. As of October 2010, the company operates 317 retail stores in ten countries, and an online store where hardware and software products are sold. As of May 2011, Apple is one of the largest companies in the world and the most valuable technology company in the world, having surpassed Microsoft. Established on April 1, 1976 in Cupertino, California, and incorporated January 3, 1977, the company was previously named Apple Computer, Inc., for its first 30 years, but removed the word "Computer" on January 9, 2007, to reflect the company’s ongoing expansion into the consumer electronics market in addition to its traditional focus on personal computers. As of September 2010, Apple had 46,600 full time employees and 2,800 temporary full time employees worldwide and had worldwide annual sales of $65.23 billion. For reasons as various as its philosophy of comprehensive aesthetic design to its distinctive advertising campaigns, Apple has established a unique reputation in the consumer electronics industry. This includes a customer base that is devoted to the company and its brand, particularly in the United States. Fortune magazine named Apple the most admired company in the United States in 2008, and in the world in 2008, 2009, and 2010. The company has also received widespread criticism for its contractors’ labor, environmental, and business practices. While this brand loyalty is considered unusual for any product, Apple appears not to have gone out of its way to create it. At one time, Apple evangelists were actively engaged by the company, but this was after the phenomenon was already firmly established. Apple evangelist Guy Kawasaki has called the brand fanaticism "something that was stumbled upon". Apple has, however, supported the continuing existence of a network of Mac User Groups in most major and many minor centers of population where Mac computers are available. Mac users would meet at the European Apple Expo and the San Francisco Macworld Conference & Expo trade shows where Apple traditionally introduced new products each year to the industry and public until Apple pulled out of both events. While the conferences continue, Apple does not have official representation there. Mac developers, in turn, continue to gather at the annual Apple Worldwide Developers Conference. Apple Store openings can draw crowds of thousands, with some waiting in line as much as a day before the opening or flying in from other countries for the event. The New York City Fifth Avenue "Cube" store had a line as long as half a mile; a few Mac fans took the opportunity of the setting to propose marriage. The Ginza opening in Tokyo was estimated in the thousands with a line exceeding eight city blocks. John Sculley told The Guardian newspaper in 1997: "People talk about technology, but Apple was a marketing company. It was the marketing company of the decade." Read the whole article on Wikipedia: en.wikipedia.org/wiki/Apple_Inc.